The Shriver Center coordinates this undergraduate scholarship program, funded by the France-Merrick Foundation. For more than 20 years, this scholarship is available for students who demonstrate an exemplary commitment to service, leadership, and civic engagement on the UMBC campus and in Baltimore City. The France-Merrick Scholarship Program seeks to combine service and reflection, build relationships, and strengthen networks to affect meaningful change. Fellows are awarded a scholarship that goes towards tuition, mandatory fees, and room and board expenses. This will not exceed $15,000 for Maryland students, $22,000 for out-of-state students, which is distributed across the 2018-19 academic year. 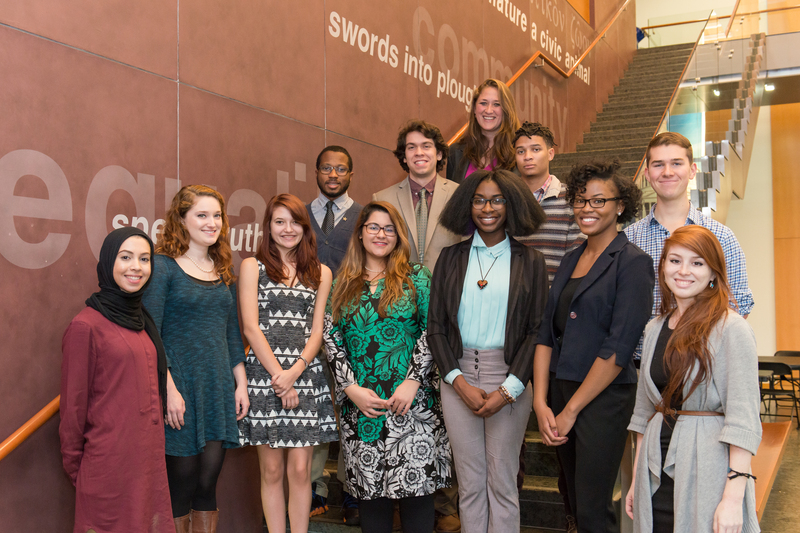 Fellows will engage in service connected with Baltimore City; serve in leadership roles (which includes convening meetings for the France-Merrick Scholarship Program), support meaningful professional development, and serve as ambassadors of service at UMBC. Scholars are awarded a scholarship of up to $2,000, which is distributed across the academic year. Scholars will engage in service connected with Baltimore City, support meaningful professional development, participate in meetings, and serve as ambassadors of service at UMBC. The number of Scholars and awards vary each year, depending on the strength of the applicant pool and available scholarship money. Congratulations to the 2018-19 Fellows and Scholars!!! 2018-19 Co-hort of the France-Merrick Scholarship Program. 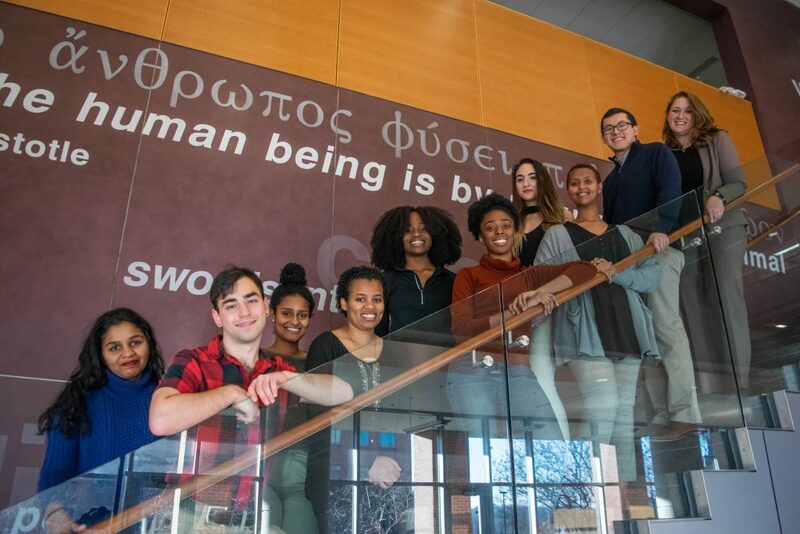 From left to right, Shiona Wijesekara, Jamey Sultan, Fikir Ejigineh, Meheret Gebreegziabher, Jessica Linus, Princess Njemanze, Ayla Novruz, Luwam Gebreyesus, Evan Avila, and Coordinator Lori Hardesty. Photo taken by Raquel Hammer ’20. Be an Undergraduate Student as of the beginning of the Fall 2019 semester (the upcoming award year). Applicants’ graduation date should be no sooner than May 2020. Incoming freshmen and transfer undergraduate students are welcomed to apply. There will continue to be significant cohort building in this UMBC program. Therefore, selected students MUST attend UMBC both semesters during 2019-20 to be considered. Demonstrated experience in service to the Greater Baltimore community. France-Merrick Fellows and Scholars will continue to participate in service to Baltimore City during the 2019-20 award year in meaningful ways. 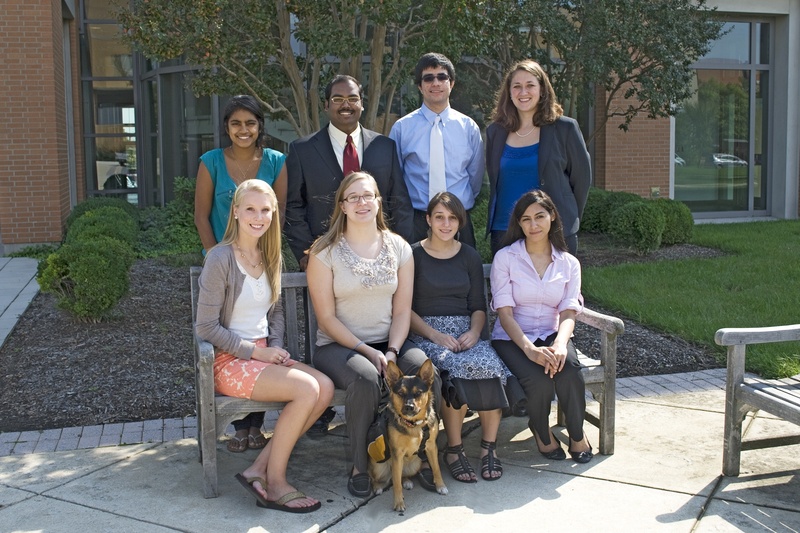 Shriver Center Staff will work with recipients to identify service opportunities and community engagement. Please be sure to include your name in the file name and in the document. Essays may be submitted as a Word document or PDF and may be saved as one file. Essays typically range between 2-3 pages double spaced. How did you develop such a passion for service? What motivates you to engage in social change efforts? How does it connect with your career goals? Describe challenges that Baltimore currently faces. What do you propose as possible solutions to overcome these challenges? How do you know that these strategies work? Identify organizations that are tackling these issues. The application opened Tuesday, January 15th, 2019 and is now closed. The Selection Committee will review applications in March. Notifications for applicants’ status will go out the last week of March. Depending on the volume of applicants, not all will be invited to interviews. In early April, group interviews will be conducted. Mid-late April, selections for 2019-20 will be announced. 2016-17 France-Merrick Cohort Awardees. 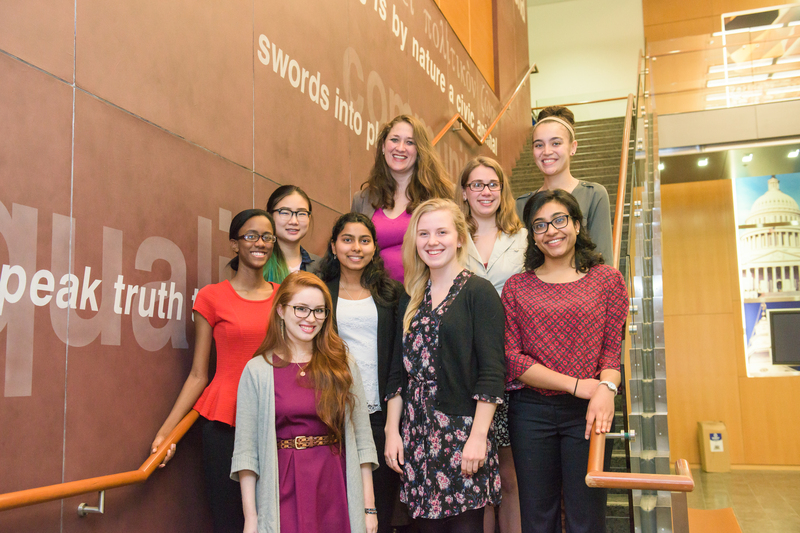 From left to right, bottom row Isabel Geisler; second row, Markya Reed, Nimasha Fernando, Amy Hoffman, Lavanya Garnepudi; third row, FeiFei Ma and Jaelyn Bos; top row, Coordinator Lori Hardesty and Corrin Markey. Not pictured: Shoba Kadavil. Photo taken by Marlayna Demond ’11. France-Merrick 2015-16 Cohort. From left to right, front row: Naureen Khan, Julianna Brightman, Cheyenne Smith, Irum Zar, Geraldine Ezeka, Nkemdilim Ndubuizu, and Isabel Geisler. Second row: Roy Anderson, Jr., Parker James, Adam Edwards, and Benjamin Fosbaugh. Back row: Lori Hardesty. Not pictured: Scott Tiffin. Photo taken by Marlayna Demond ’11. 2011-2012 France-Merrick Scholarship Cohort 2011-2012 France-Merrick Scholarship Cohort. Front row, from left to right: Stephanie Pully, Amy Poole with her Service Dog Honey, Kelly Cyr, and Aleeza Abbasi. Back row: Revathi Chandry, Gift Jayakar, Salar Khaleghzadegan, and Lori Hardesty. Photo from UMBC archives.